JACKIE JACKSON says a short drive from his house is all it takes to bring music legend brother Michael to mind – and start the tears flowing. Jackie, eldest of the Jackson brothers, lives in Las Vegas where a Cirque du Soleil Michael Jackson show is a massive attraction. So, even after nearly a decade since the Thriller star’s death in 2009, his image is still everywhere. “I still miss him very much,” Jackie, 66, tells iN10. “Every time I go to the Strip and stop at a red light, there’s a bus or a billboard with Michael’s face all over it. Jackie, who’ll be playing in Scotland with his brothers at Scotfest this summer, insists he’s so proud of the work his younger brother did. Jackie says Bruno Mars was working on some of Michael’s music earlier this year and it’s indicative of its staying power. “It’s still around because it’s great music,” he adds. “That’s what happens with great music, it lives on because that’s what people want to hear. The Jacksons will be star attractions at Scotfest at the beginning of July. Boyzone, B*witched, Liberty X, Five and East 17 are among the other acts on the bill. 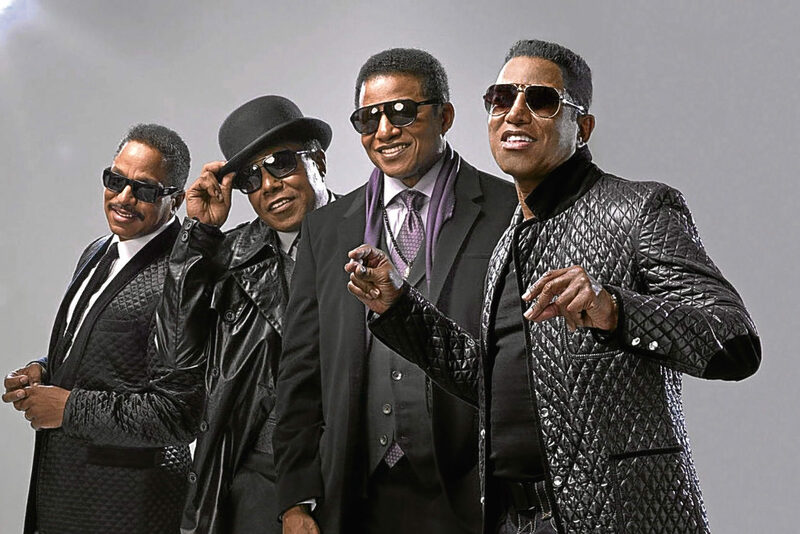 Jermaine, Tito and Marlon will, as usual, be alongside Jackie on stage but having performed with Michael since his earliest childhood, he still feels the loss. “You never forget those days,” says Jackie. “We’ve been out there performing without him for years now but at any given time we know where he was going to be on that stage. “We feel the emotional vibration all the time. It gives us a big charge because he’d have given 110% and that’s what we try to do to. It’s as high-energy a routine as ever and Jackie admits he hits the gym to get in shape before taking to the road. The workout sessions start at 5am as he has a full family life. He and third wife Emily have four-year-old twin boys, River and Jaylen, and Jackie gets back from his workouts to get them ready for school. “I love being a dad,” says Jackie. “They know every Jacksons song, every Janet Jackson song, every Michael Jackson song. They’re pretty sharp boys and can do all the routines. I watch them and reminisce as they’re doing all the things I used to do. “I can see myself in them when I was their age. I spend my days running after them. They like me to act as a big bear and chase them. Jackie insists he’s never lost his love of music and has his own label where he’s been working with a French duo called Gold Lemonade. Jackie is no stranger to Scotland, both from big Jacksons tours and also from holiday visits. But with a nice lifestyle in Las Vegas – Celine Dion lives two doors away, Chris Tucker two doors the other way – isn’t there a temptation to put his feet up enjoy home life. “I don’t think like that,” he adds. “My boys love watching their uncles and myself performing. “Of course you like to be home with your kids but after a break I want to get right back out there. “It’s great exercise for me and it’s what we do best. I’m at my happiest when I’m on stage, especially when my family can be there too. “My wife is from Amsterdam so when we go to Europe she’ll come with the boys.